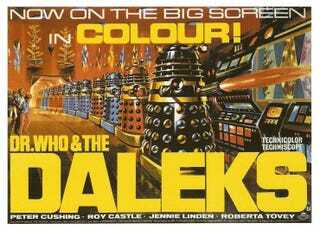 Peter Cushing starred in two stand-alone "Doctor Who" movies back in the '60's (Dr. Who and the Daleks in 1965, and 1966's Daleks — Invasion Earth: 2150 A.D. the following year) and they have a achieved something no other "Who" property has managed to do; they made the Daleks downright boring. I tried to watch the first film a while back, and it was...odd. Cushing played a doddering, shuffling old man (much older than his real age at the time), bereft of the intensity that always made him interesting to watch, even in really bad, low-budget Hammer Studio films. I must have missed the exposition (or never got to it), but apparently this Doctor Who only had one heart; he was a human whose last name happened to be "Who," and had built a time-traveling spaceship that just happened to look exactly like the TARDIS. Think of a guy from Kansas whose name just happens to be Kal El (or Clark Kent, depending on the circumstances); he goes around fighting crime and bad guys—but he can't fly. Or stop a bullet with his chest. Or see through your clothing. You get the idea. The 1996 TV-movie has been derided for making The Doctor half-human (something that was wisely ignored in the reboot), but these films made him completely human. The 2008 Christmas special, 'The Next Doctor," features a man (David Morrissey) who has lost his memory, and thinks he's The Doctor due to some kind of transference of memory with the real one. The Cushing version is like that—except that he knows who he is, and the similarities between this particular human and that particular Time Lord are really never explained. I guess. The TV-movie starring Paul McGann as the eighth Doctor (his only appearance, up until a great webisode produced for the 50th anniversary special last year—making me wish for more) isn't amazing, but it's worth watching for McGann's performance. You don't really have to see the eighth Doctor to make sense of what comes later; as the webisode shows, he transforms into the War Doctor (John Hurt from the 50th anniversary episode, "The Name of the Doctor") partway through the Time War. That war has apparently just ended when we meet the tenth Doctor, the first of four (so far) in the 2005 reboot. You might enjoy it nonetheless, despite some '90's cheese; as for the two Cushing outings, it's probably best not to go there.